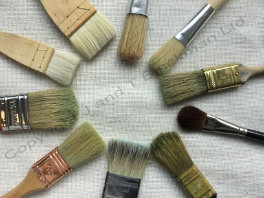 Brushes are not only excellent for applying the wax/oil mixture, but also for creating texture and patterns. Cold Wax Painting Medium has substance, therefore, brushes that are full-bodied and open bristled are necessary to hold the wax/paint mixture, without, compromising the functionality. 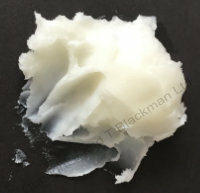 All brushes in the image left are natural bristle, the filament is strong enough to hold the weight of wax/oil, however, they're also delicate enough to make 'fine marks' and 'lace like' patterns. These are Pointed Round, Sash and Fitch decorators brushes, easily cleaned and hold their shape. 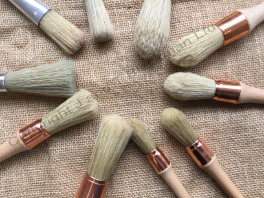 Like the Round brushes, the natural bristle can be loaded with paint/wax mixture and used with a stippling action to apply to the surface. Flat and Lily would be a choice, indicated by their copper ferrule in the image. As always, it pays dividends to experiment with flat brushes, therefore, spend time learning the marks they make.